Railpictures.ca - A.W.Mooney Photo: How times have changed in Parry Sound. 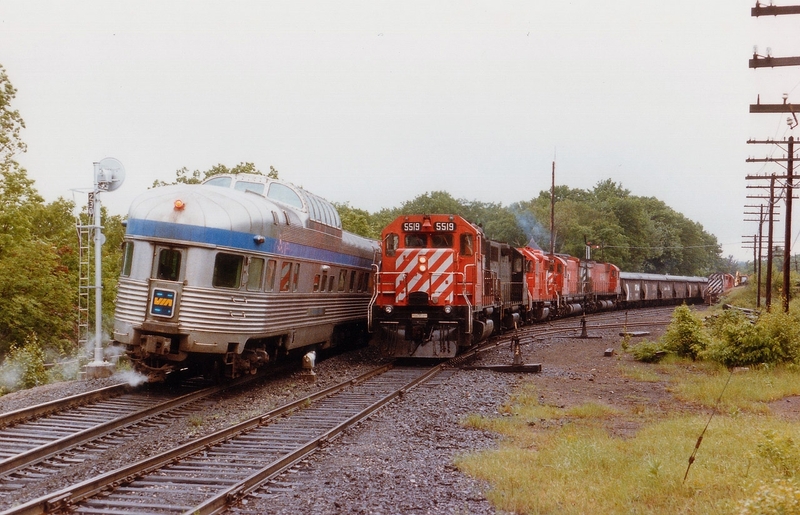 Back in 1986 one could spend most of the day in town and be constantly busy bagging trains on both the CN and CP. Here at Parry Sound CP station we see the northbound Canadian with VIA 6313 and 6631 stopped for passengers while southbound freight #912 tries to squeeze by with CP 5519, CR 7793, CP 3073, 4715 and 4570. On the siding is CP 8747 with a work train. Not only is it rather dead there now in comparison, the tracks other than the main have been pulled up. | Railpictures.ca – Canadian Railway Photography – photographie ferroviaire Canadienne. Caption: How times have changed in Parry Sound. Back in 1986 one could spend most of the day in town and be constantly busy bagging trains on both the CN and CP. Here at Parry Sound CP station we see the northbound Canadian with VIA 6313 and 6631 stopped for passengers while southbound freight #912 tries to squeeze by with CP 5519, CR 7793, CP 3073, 4715 and 4570. On the siding is CP 8747 with a work train. Not only is it rather dead there now in comparison, the tracks other than the main have been pulled up.